An easy side dish with layers of flavor that’s a delicious addition to your dinner any day of the week. It’s wonderful when asparagus is in season and are on sale for a great price. Each time I see asparagus on sale I’m thinking I’d better grab some before the prices go up again. So I do and then it goes on sale again the next week which means asparagus is taking over my fridge. This also means that I for sure need to change up how I prepare it or I’ll get tired of it. Or maybe it’s okay to get tired of it, but just not until the prices go up again. I’m okay with that kind of timing. 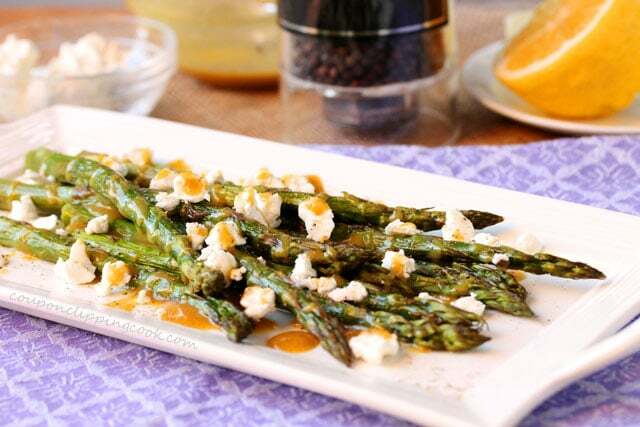 Roasted asparagus tastes so good when cooked with a light coating of olive oil, salt and pepper. 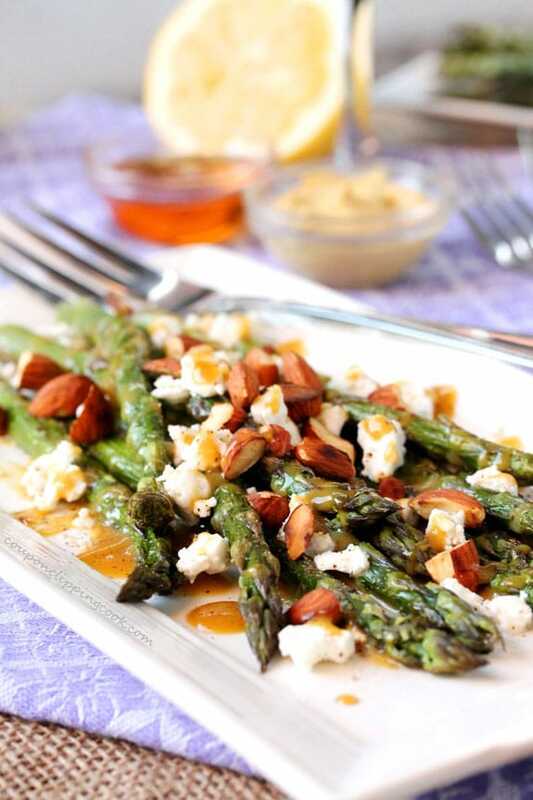 This recipe adds to the goodness by topping roasted asparagus with a touch of lemon juice, a quick and easy honey Dijon sauce, goat cheese and crunchy toasted almonds. It’s a must to get each one of these toppings in every bite. They taste wonderful together. 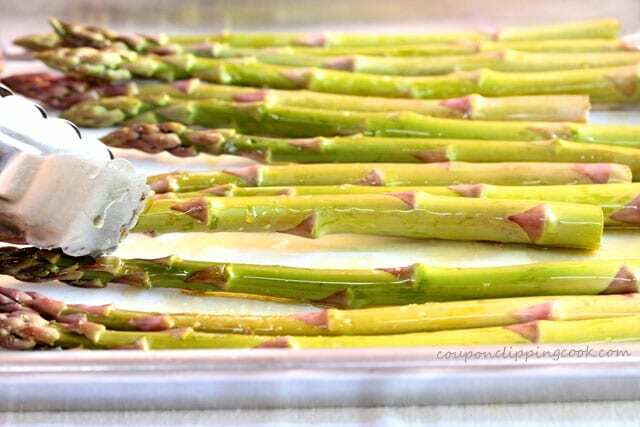 This dish is especially good with medium-sized diameter asparagus spears so they still have a crunch to them after being lightly roasted in the oven (rather than the smaller diameter sized asparagus). Maybe this recipe could be referred to as an asparagus salad of a sort because it doesn’t have to be served warm, it’s actually delicious when served at room temperature. 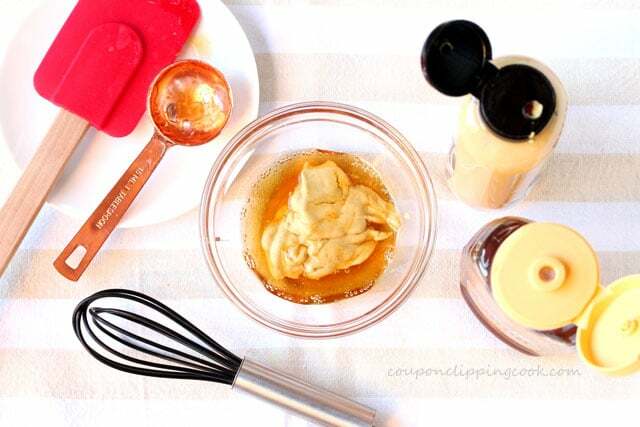 This is great for making ahead of time too. 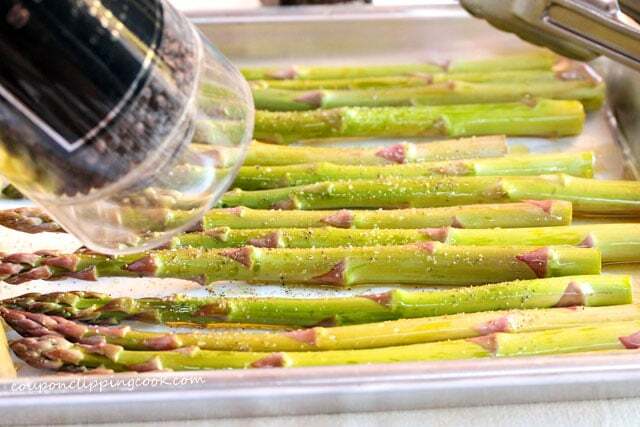 Just roast the asparagus ahead of time and store it in the fridge until assembling the dish before serving. 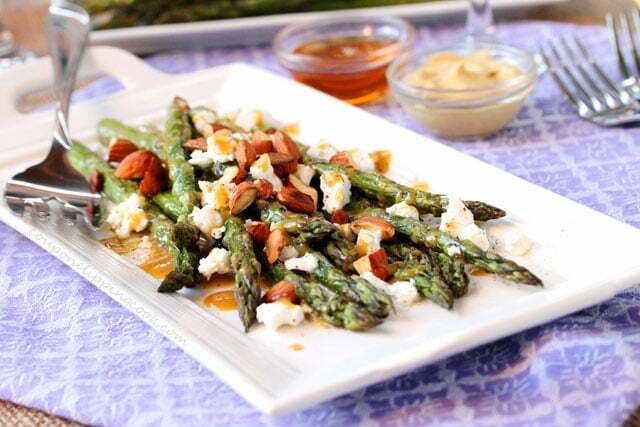 If feeding a crowd, think of how pretty this asparagus dish would be on a big platter. 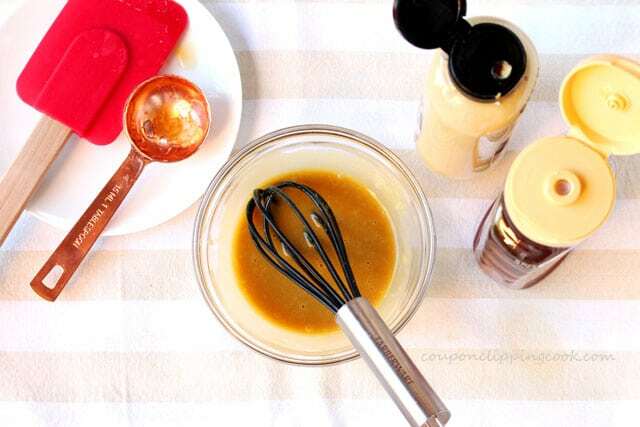 Before we move on to the ingredients and how to make it….a big thank you for visiting CCC! Trim the end of the spears off and discard. Lay the spears flat on to a parchment paper-lined cookie sheet. 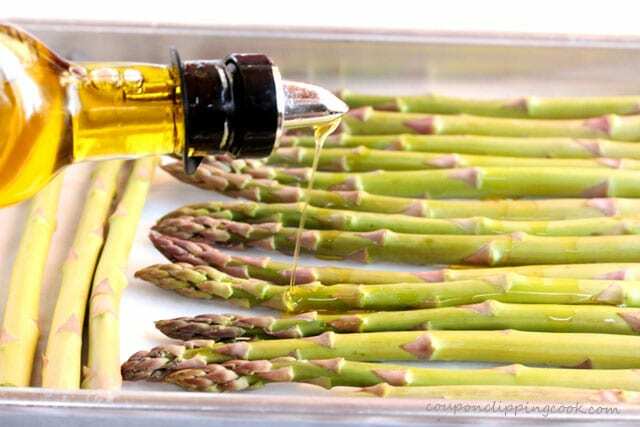 Drizzle olive oil on the asparagus. 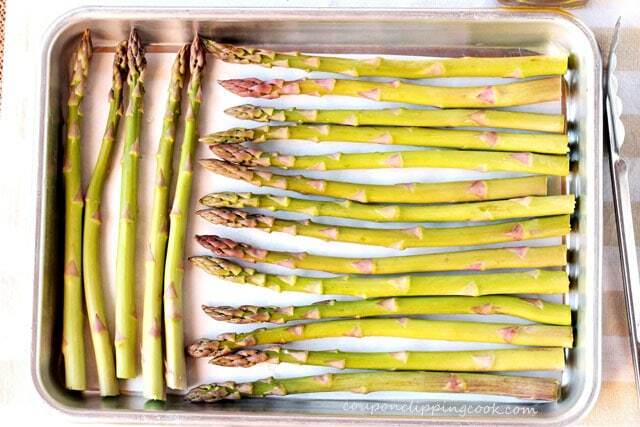 Turn each spear around to coat all sides of the asparagus with olive oil. 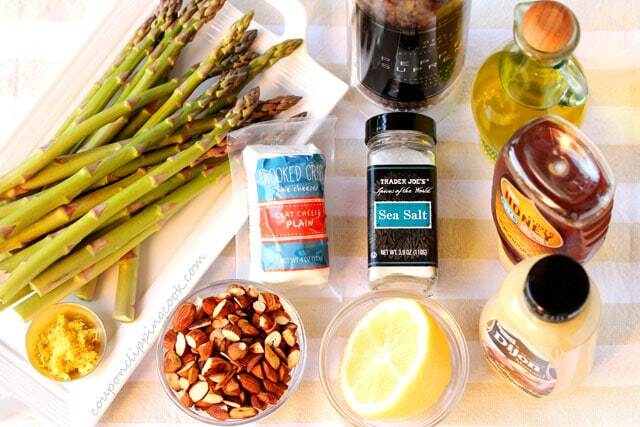 …and pepper to all sides of the asparagus. Bake in a preheated oven for 14 minutes. The spears should still be a little crispy after cooking. 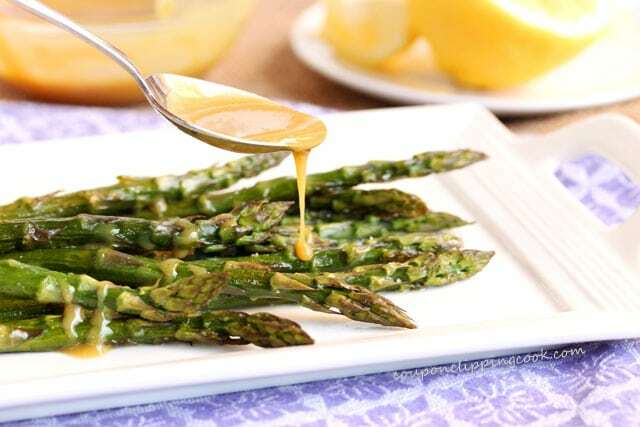 While the asparagus is in the oven, in a small bowl, add the honey and Dijon mustard. Whisk together and set aside for a moment. 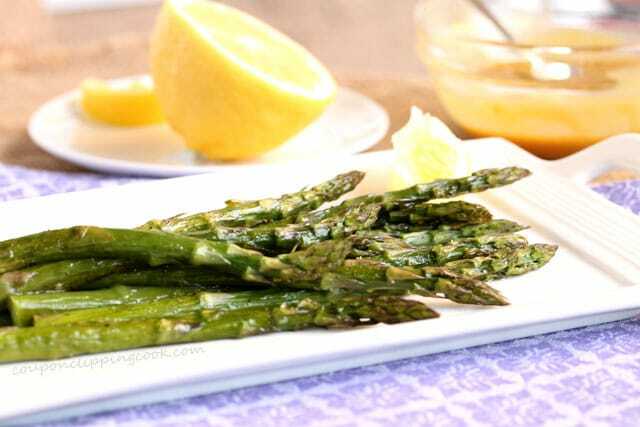 Lay the asparagus on a serving dish and top with fresh lemon juice. …reserve about 1/3 of the sauce for use after adding the goat cheese. 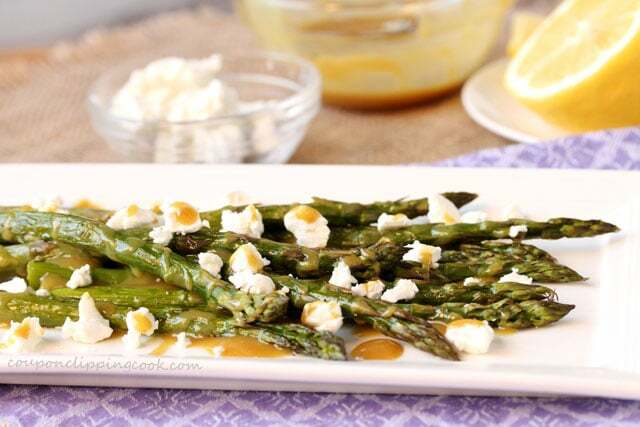 top the asparagus with small pieces or crumbles of goat cheese and drizzle the remaining honey Dijon sauce on top. …toasted almonds, and lemon zest (optional). 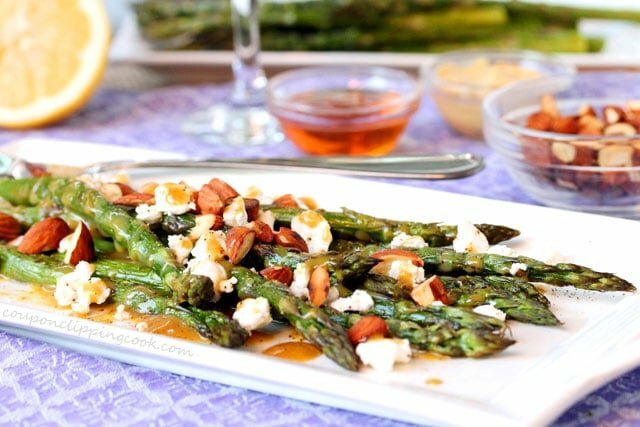 Serve while the asparagus is warm or at room temperature. 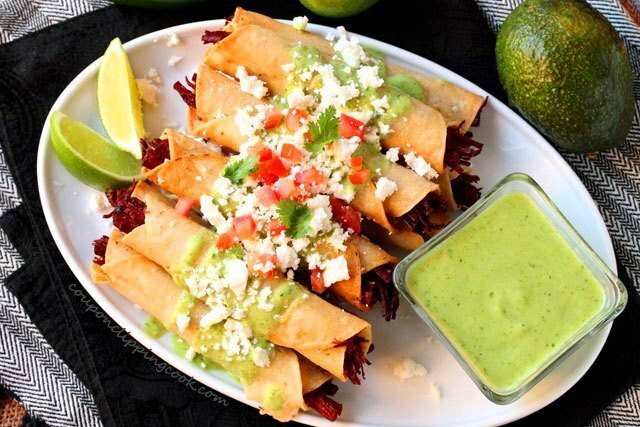 An easy side dish with layers of flavor that's a delicious addition to your dinner any day of the week! 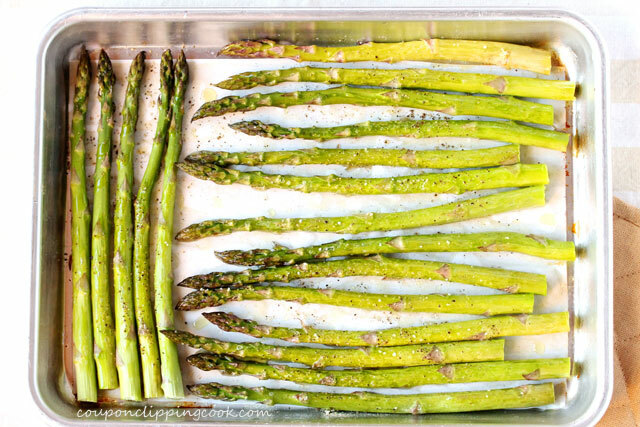 On a parchment paper-lined cookie sheet (with sides), lay out the asparagus so that each spear is setting flat on the pan. 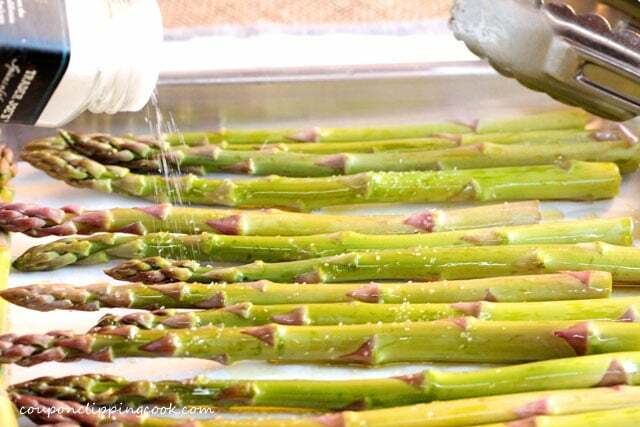 Drizzle olive oil on the asparagus and turn each spear so that the oil covers all sides. Add salt and pepper to both sides of the asparagus. Bake in a preheated oven for 14 minutes. The spears should still have a little crunch to them. 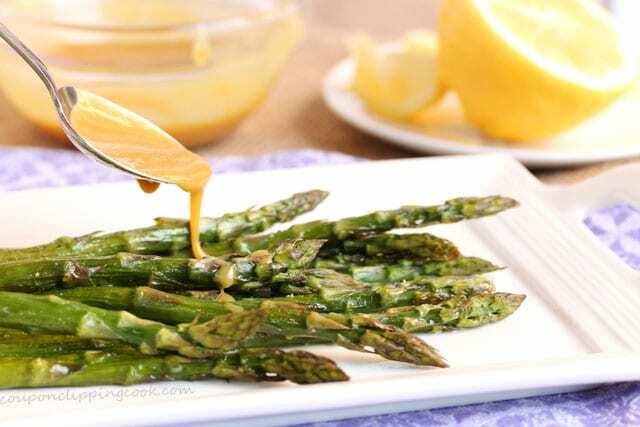 Transfer the asparagus on a serving plate. 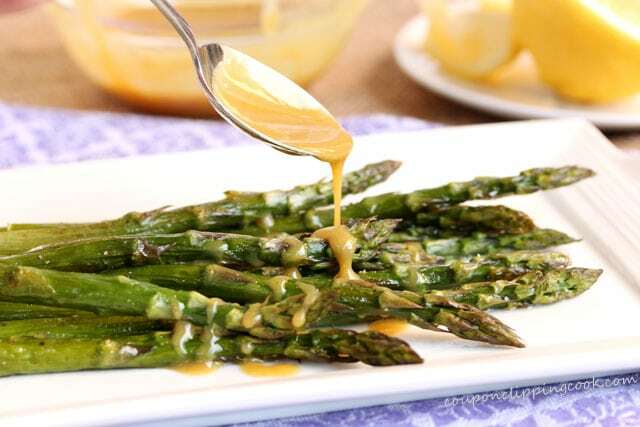 While the asparagus is in the oven, in a small bowl, add honey and Dijon mustard. Whisk together and set aside. Top with fresh lemon juice, drizzles of honey Dijon sauce (reserve about 1/3 of the sauce for use again after adding the goat cheese). 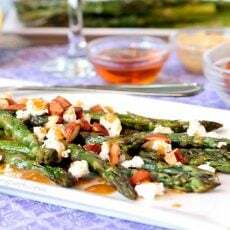 Then top the asparagus with small pieces (or crumbles) of goat cheese, drizzles of the remaining honey Dijon sauce, a couple dashes of freshly ground pepper and toasted almonds. 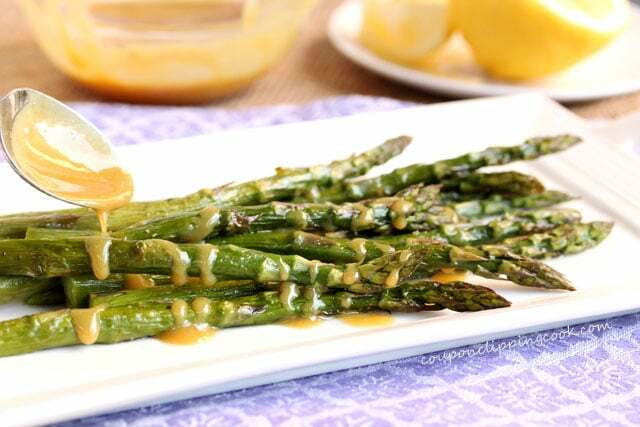 Serve while the asparagus is still warm or at room temperature.